Ahh, Facebook Live Streaming. Words that sparks dread in a lot of people. Most of my clients say they see the value of doing Facebook live streaming. They also see the potential it has to build their audience. But for many, they still struggle to remove themselves from behind the camera to share their knowledge in front of it. Despite photographers reluctance to put themselves out there in a Facebook live video, there is no denying that Facebook Live streaming is a powerful promotional tool that can generate up to 10 times more engagement from comments and views than regular pre-recorded videos. 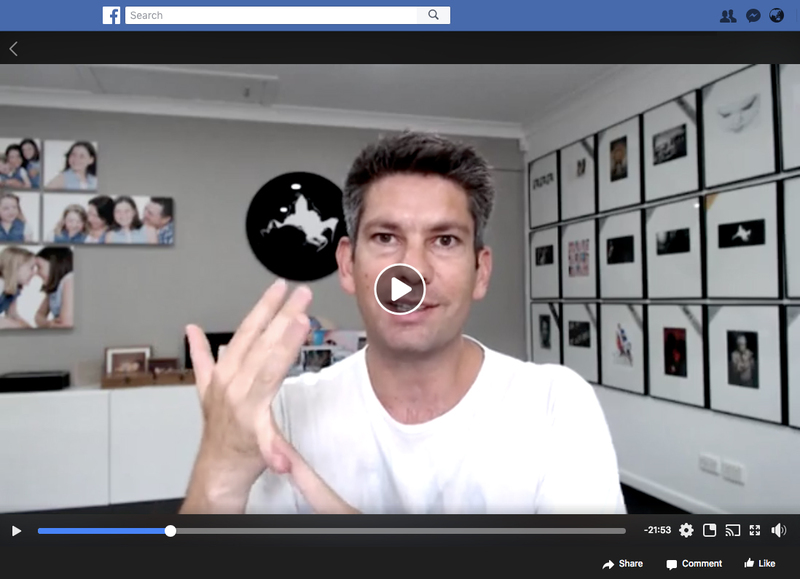 So, to inspire and challenge you to get out from behind the lens and in front of the camera, I am sharing my knowledge around Facebook lives, including my top do’s, don’ts and tips to help you take the plunge into Facebook Live Streaming. Before hitting the record button on your Facebook Live, make sure you know what you are going to talk about, in what order and for how long. This is a sure-fire way to help overcome the nerves of doing a Facebook live and to help boost your confidence. Planning and preparation also gives your live stream direction and helps to minimise any ahhs, umms, vagueness and other distractions while you are talking. #Top Tip Have your Facebook Live content written down and clearly outlined in dot points on paper or on a whiteboard for easy reading while you are live streaming. Tell your audience ahead of time that you are going to be doing a live stream. Share with them the day, time and topic you will be talking about. This gives them a chance to rearrange their schedule and be there to engage with you while you are live streaming. Facebook algorithms love engagement and the more engagement you get while you are live streaming is going to be great for your reach. So, give your audience plenty of time to show up and connect with you during your Facebook live. #Top Tip Post an announcement on your Facebook page or group a few days before you intend to go live. The more notice you give to your followers the better. There is nothing worse than a dodgy connection where you are trying to do a live stream, but the sound is cutting in and out, the picture is pixelating and no one can follow what you are saying. Avoid this by making sure you have a strong internet connection and all other technology, such as your microphone and camera, are working well. Try different locations to get better reception if you have to and when you jump on to your live stream ask your audience if they can hear and see you or if there are issues you need to adjust. It’s good to know that Facebook Live streams are recorded in portrait mode, so hold your phone upright, unless you want to present sideways. And when holding your phone, make sure to keep your fingers well away from the microphone. A rookie error I see time and time again is muffled sound on Facebook lives where people have blocked the microphone with their finger. #Top Tip – No one wants to watch you present sideways! Record in portrait mode. Take stock of your surroundings. This is important, particularly for photographers. As a photographer, displaying images and products in the background of your Facebook Live is an excellent way to showcase your work, show your skills and increase your authority with your audience. What you don’t want to show in the background is clutter, mess, your work diary or any other personal effects you would rather your potential clients not see. You also don’t want to record your Facebook live stream against a blank backdrop… Boring! Many times I see photographers talking about their work and their background is blank. This is such a missed opportunity. #Top Tip If you don’t have any images or artwork on display, use your photography lights or other props instead. Get creative! It’s important that you consider the audience’s experience at all times throughout your Facebook Live Stream. This means trying to eliminate anything that might be distracting and/or annoying. Little things such as a shaky camera, distracting background noise, glare in front of your face or low voice tone can be off-putting during Facebook Live streaming. So, make sure you hold the camera still (use a tripod if you have to), project your voice and be mindful of any glare coming from windows or lamps. #Top Tip It’s a personal choice if you want to sit or stand during your Facebook Live but you should consider your position in relation to the topic. If you are talking about a topic that is more serious in nature, then you may want to consider sitting in one position with your camera on a tripod to help convey a more formal tone. On the other hand, if you are showing your studio, showcasing new products or you are going live behind the scenes on a shoot in progress, then standing up and moving around and presenting in an excited or less formal manner is going to be much more fitting. There is a slight lag between when you go live on Facebook and when your audience actually sees your footage, so be mindful of this and allow a little extra time when starting out, stopping and receiving responses. While the lag is really only around 3 to 5 seconds, a 5 to 10 minute delay at the beginning of your live stream before getting stuck into your content is a good time frame to allow your audience time to jump on without missing any information. This time delay is also a good opportunity to check everything is running smoothly with your equipment and internet connection. Be mindful of the time lag when you are ending your Facebook Live as well. Give yourself a few extra seconds after saying goodbye before clicking the stop button. Doing this provides your audience with the chance to engage one last time by giving you a final thumbs up or writing one last comment. #Top Tip Having pauses in content at the beginning, end and during the live stream provides a perfect opportunity to reach out to your audience, ask questions and further boost engagement. The more you can get your audience to engage the better. There are very easy ways you can do this. You can ask your audience to give a thumbs up if they can hear you, ask them to say hello in the comments or you can ask where everyone is from. You can also ask for feedback on the content throughout the live stream or ask if anyone can relate to what you are sharing. Along with asking engaging questions, it’s also a great idea to ask your audience to share your live stream and/or tag a friend who may find the content useful. If they do this while you are still streaming live it will help to boost your organic reach. #Top Tip Remember to give a shout out to the people that have taken the time to respond. People like being acknowledged and if you refer to people’s responses and acknowledge them by name, they are far more likely to keep engaging with you and stay to the end of your stream. Everyone worries about making mistakes, looking silly or coming across as unprofessional on their Facebook Live. After all, it is live! No chances to stop and start again right? Don’t even give this a second thought. Your Facebook Live does not need to be perfect! In fact, the last thing you want is for your Facebook Live videos to be so polished that all your emotion and personality has been stripped away. Some Facebook Live videos I have seen are so professional and polished that they appear fake. It’s really not a good look! Remember, the whole idea of Facebook Live streams is to connect with your audience. The most important thing is to be yourself, don’t worry about little slip-ups and enjoy the moment. #Top Tip There is definitely a time and place for polished professional videos, but it’s not on a Facebook live. When it comes to Facebook Live streams, people want to hear from and engage with the real you. Flaws and all. Yes, I know I have given you advice above on planning and preparing for your Facebook Live, but this doesn’t mean to say you shouldn’t also be spontaneous. The very nature of Facebook Live encourages spontaneity. You don’t always have to plan out your Facebook Live in detail, you can wing it if the opportunity calls for it. In fact, doing spontaneous Facebook Lives during unique moments are often the ones that get the most engagement. For example, one of my clients was finishing up on an amazing shoot with triplets and she jumped on Facebook to do a quick live to share the experience and her emotions about the shoot. She then followed this up shortly after with a finished image from the shoot. This was marketing gold and the engagement she received from that one video was amazing! #Top Tip Have fun with your Facebook Live. If you are having fun, your audience will pick up on this and will enjoy it also. Want more Facebook Live do’s, don’ts and hot tips? These are just a few do’s and don’ts I recommend all photographers take on board when doing their own Facebook live videos. Do you want to hear more? Head over to Facebook and join me in The Photography Business Coach group to see my original Facebook Live Tips video showcasing all my do’s and don’ts in action along with exclusive footage showing industry tricks that can also work in your business.